I've checked my app folder and the app is definitely in there. Miranda, the Tenfourfox app in your Applications folder must be named "TenFourFox7450.app" or "TenFourFoxBoxRunner.app" or "TenFourFox.app". If it's named anything else on a 7450 G4 machine, Tenfourfoxbox won't work. I am also getting the same message. 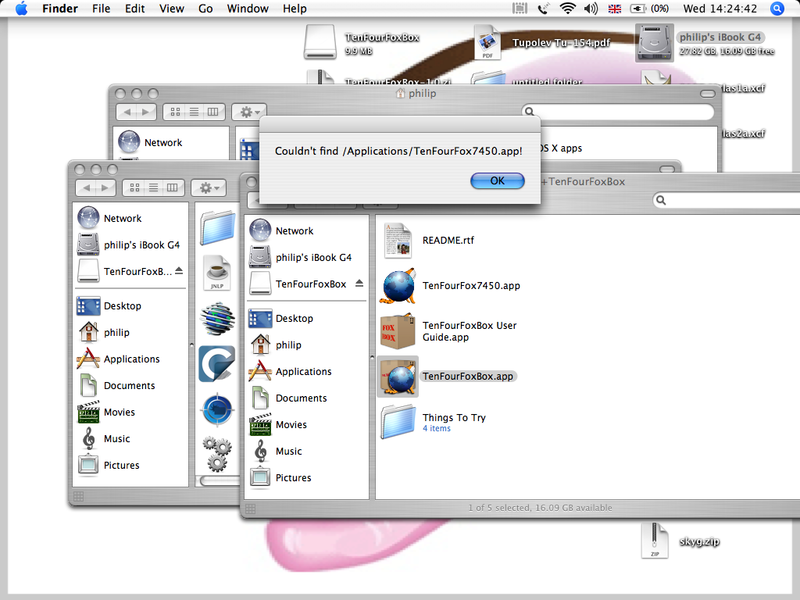 I have just updated to TenFourFox7450-45.8.0 and it resides in a folder called "my OS X apps" --> "TenFourFox+TenFourFoxBox"
Right from the start when I purchased my iBook G4 several years ago, I decided to place my apps in my home (ie 'philip' folder/directory and call it 'my OS X apps' (seperate from the pre-installed OS X apps). 'TenFourFox7450' does launch from here, and my other apps; but I too am unable to launch 'TenFourFoxBox' and the included apps that are included with it. I have attached a copy of the screenshot. "Make sure TenFourFox 38.4 or higher is installed in your /Applications folder." To me this means: If TenFourFox is not installed in this folder, TenFourFoxBox won't work. That's correct, it must be in /Applications. Because all of the TenFourFox apps have the same creator code, they must be disambiguated on filename, and it would seriously impact startup time to have to search the entire hard disk.